It walked on two feet when it was young, but on four when it was old. It could grow up to 3 meters in a single year — if it survived that long. And it may have been warm-blooded. Dinosaurs known as Maiasaura roamed the high, dry valleys of what’s now northwestern Montana some 75 million years ago, and an enormous bone bed there containing thousands of the animals is allowing scientists to learn more about this dinosaur than any other that’s ever been studied before. For years, researchers have been studying the remains hauled out of the fossil bed, comparing bones from specimens of different ages and both sexes in order to create — for the first time — a complete life history of an extinct dinosaur. “This is a dramatic step forward, from studying fossilized creatures as single individuals to understanding their life cycle,” said Dr. Jack Horner of Montana State University, in a press statement. Horner was part of the team that first discovered the bone bed in the late 1970s, buried under hundreds of acres of mudstone and volcanic ash that had blanketed part of Montana in the Late Cretaceous. 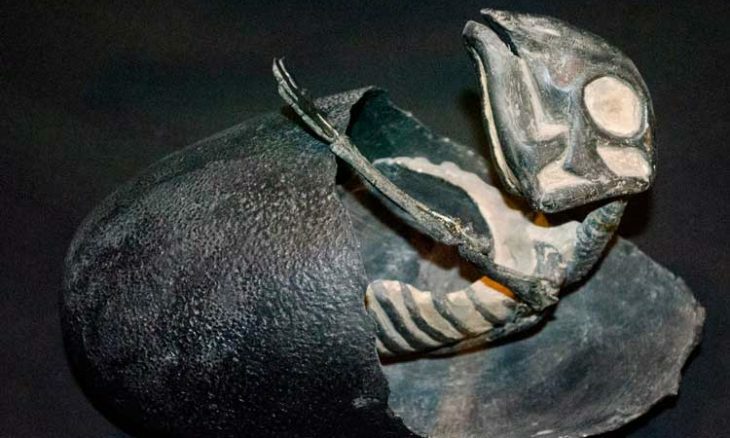 The find gained fame not only for the abundance of dinosaur remains that it contained, but also for the surprising revelation of dinosaur nests, including fossilized eggs, some with embryos still intact. They were the first dinosaur eggs ever found in the Western Hemisphere, and the site was the first to reveal adult dinos alongside their young. And today, a former student of Horner, Dr. Holly Woodward, is documenting the life and times of Maiasaura by scrutinizing their remains at the cellular level. With a focus on histology — the study of the microscopic anatomy of cells and tissues — Woodward has taken the same type of bone from 50 different specimens in the bone bed, a leg bone called the tibia, and studied them each under the microscope. The dinosaurs’ fossilized bone tissue reveal a clear series of changes over time, Woodward reported, marking major life events in the animals’ lives, including early growth, the development of sexual maturity, and the onset of old age. Dr. Elizabeth Freedman Fowler, curator of paleontology at Montana’s Great Plains Dinosaur Museum, helped with the analysis. 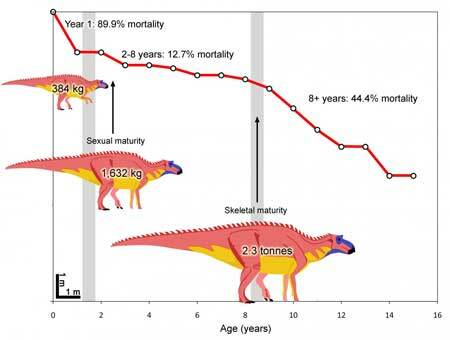 Specifically, the team’s results showed that Maiasaura typically reached sexual maturity at age 3, and by age 8, they were fully grown, reaching masses up to 2.5 metric tons. But hitting that benchmark was a rare triumph. 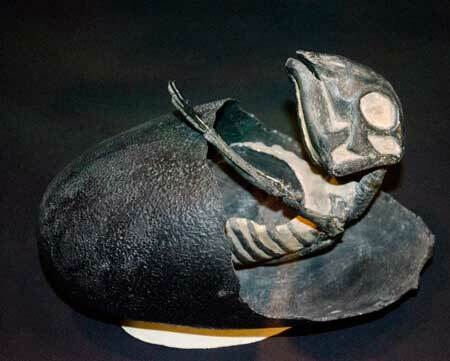 Based on the samples studied, 90 percent of Maiasaura died before their first birthday. And after age 8, fewer than 45 percent lived to see another year. The bones also showed that, as with most modern animals, including humans, Maiasaura came in all sizes, and how big a dinosaur was did not always reflect its age. Dinosaurs with short leg bones, for instance, could turn out to have mature bone tissue, indicating that the animals were not young, just smaller than average. “Our results suggest you can’t just measure the length of a dinosaur bone and assume it represents an animal of a certain age,” Woodward said. “Within our sample, there is a lot of variability in the length of the tibia in each age group. What’s more, the bone tissues revealed that Maiasaura grew at a surprisingly rapid rate. By some estimates, babies were barely more than a third of a meter [1 foot] long upon hatching, but by age one — if they lived that long — they could be more than 3 meters [10 feet]. By comparing the Maiasaura bones with those of a living relative, the common alligator, Woodward found that the dinosaurs attained greater and faster growth early in life, whereas alligators underwent lower and slower sustained growth throughout their youth. Maiasaura’s strikingly rapid growth rate is similar to that found in modern birds, the researchers noted, which have very high metabolism. These and other findings are possible thanks to the groundbreaking scope of the new study, encompassing the largest-ever sample size of its kind, covering an age range of specimens from hatchlings to adults. “No other histological study of a single dinosaur species approaches our sample size,” Woodward size. These findings only mark the beginning of what the team has deemed the The Maiasaura Life History Project, a years-long effort to continue exploring the Montana bone bed to completely reconstruct the environment in which these dinosaurs lived, and plot their life stories from the moment they hatched until the time that their remains fossilized. “We plan to examine other skeletal elements to make a histological ‘map’ of Maiasaura, seeing if the different bones in its body grew at different rates, which would allow us to study more aspects of its biology and behavior,” Woodward said. The team reports its findings in the journal Paleobiology.